The 2013 fee guides for Alberta, Manitoba, Ontario, Quebec and Saskatchewan are now available for download. The ClearDent team would like to wish you a very happy and festive holiday season. This year has been a very special year for ClearDent as we celebrated our 10th anniversary! 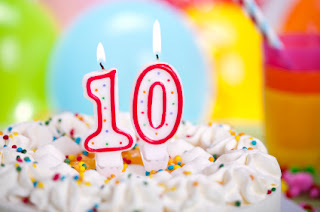 On September 22nd, 2012, ClearDent (Prococious Technology Inc.) marked its 10th anniversary! 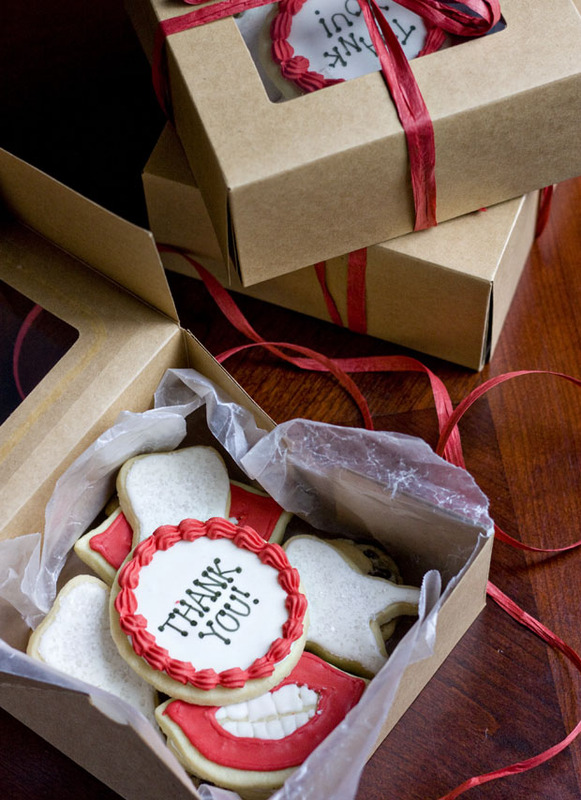 On behalf of ClearDent, we would like to express our deepest appreciation to our customers and our team. No business becomes successful overnight. 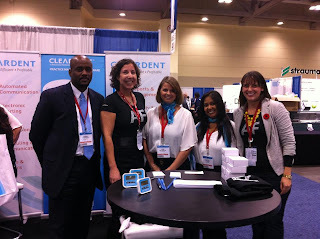 ClearDent had a humble beginning in 2002, when a group of passionate Simon Fraser University graduates realized that there was a demand for modern and innovative dental software in Canada. Like many developers of the technology world, where legacies started in a basement (or a garage) and with recycled computers, ClearDent had its basement year and Frankenstein computer (pictured below) during its inception. Our founders pushed on, firmly believing that, by blending their passions with their work, they would be able to introduce a new kind of thinking and innovation to how dental professionals relate to the software they use. They simply believed paperless was what the dentists needed long before the industry caught up. Today, both ClearDent (the software) and Prococious Technology Inc (the company) are well respected among industry peers, customers, and by technology companies in other industries. 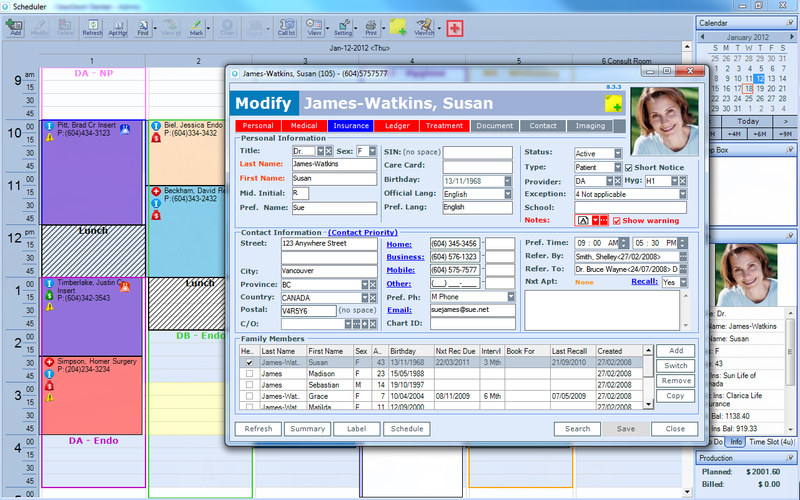 In 2010, ClearDent introduced ClearConnect (Automated Contact Manager) We believed that we could make the patient experience paperless as well. With ClearConnect, dental practices can communicate with patient through text message, email and phone. 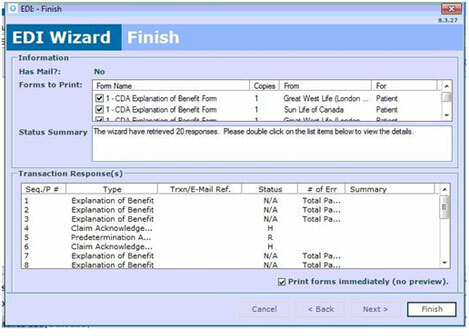 Patient responses are directly synchronized into ClearDent, reducing administrative overhead and improving patient loyalty and office productivity. 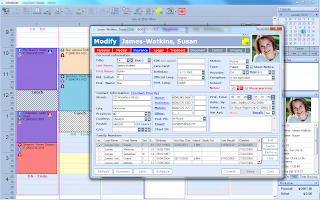 In 2011, ClearDent integrates its dental digital imaging and electronic charting components with companies such as Vatech (Grey Falcon), ImageLevel (CADI) and Carestream Dental (Kodak), just to name a few. This deep integration allows us to offer dentists the ability to use 3D CBCT that’s fully integrated with our paperless workflow model, where you can see the CBCT studies, patient charts, clinical notes, and documents all together in one place. We have also integrated our ClearConnect and Scheduler with companies such as Clinicbook, HealthAware, and others to enable online booking and various integrations with social media for dental practices interested in providing such functionalities to the patients. And finally in 2012, we introduced our mobile components beginning with the KIOSK with more components to come into the mobile space. Our innovation continues. We also recognize the importance of contributing to the dental communities, and we chose to donate our software to recognized dental organizations that provide dental services to the less privileged. We also run fundraising campaigns at trade shows and conferences. Instead of just giving away prizes, ClearDent makes a donation for each ballot filled out by visitors. This season, we are supporting AboutFace, a not-for-profit organization for people with facial deformities needing treatment. As the leader in the dental practice management software, we are committed to and strive for excellence in software development and services. We hope to grow with your dental practice for the next 10 years and beyond. With thoughts and reflections on our achievement, we sincerely invite you to help us become better by sending us your thoughts and comments when you can. You can connect with us via our presence on social networks, visit our feedback page, or simply give your rep or our support a call. 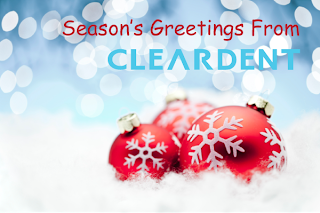 Happy Holidays from the entire ClearDent team! As of 6:00am PST (9:00am ET), the ITRANS service was interrupted and not resumed until about 9:30am PST (12:30pm ET). Unfortunately, due to some technical circumstances, the ITRANS client software, called iCA, which is responsible for encrypting and transmitting the claims from your practice to the insurance companies through ITRANS could not automatically resume itself. 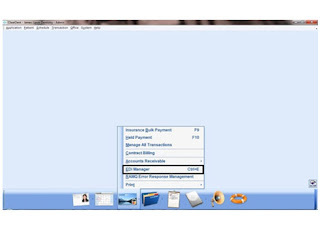 You will need to restart your iCA manually by following the instruction in this article. 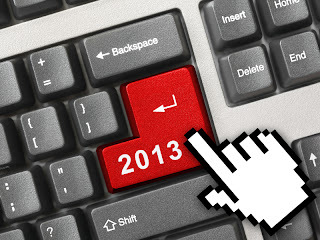 The 2013 Ontario Fee Guide is now available. 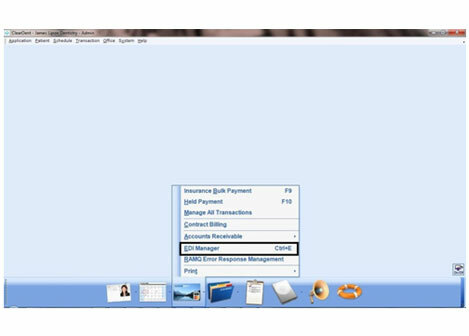 Please contact technical support to get the fee guide uploaded to your system. More and more insurance companies are sending electronic responses via CDAnet and ITRANS to dental offices. 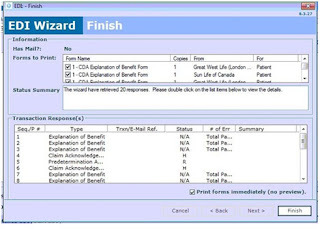 These responses are typically for claims that could not be adjudicated in real time because they are more complex or require supporting documentations such as x-rays, lab invoices, etc. 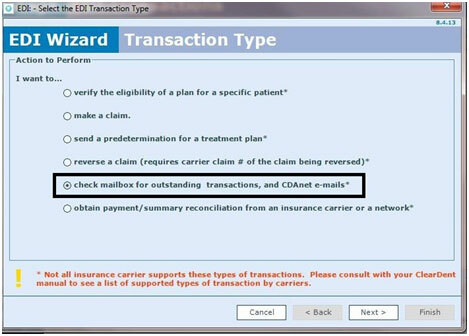 In ClearDent, when you send a claim and the "Status" field in the Claim Acknowledge response reads "Held - Electronic Response Will Be Sent Back Electronically," you can use the feature "Request for Outstanding Transaction" a few days later (usually the next business day; sometime the next week) to get the response after it has been reviewed by the insurance company. This way, you will know if a claim that was not adjudicated at the time of submission will be paid or not sooner. 4. 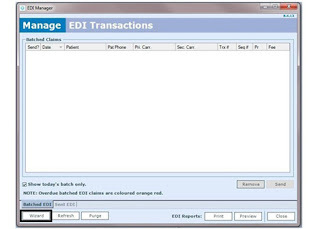 On the next screen, you will need to select proper provider for CDAnet Emails and CDAnet Network. 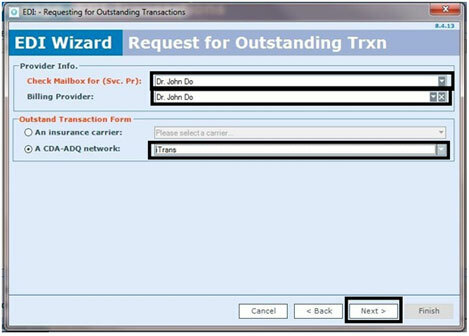 We will select itrans in this case and click Next. 5. 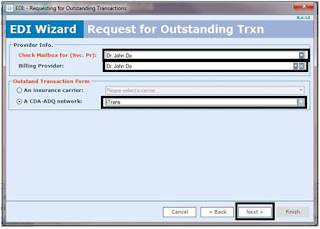 Once you click Next, it will connect to itrans (EDI) and will download outstanding responses from Insurance agencies. It might take some time to download all the responses. 6. 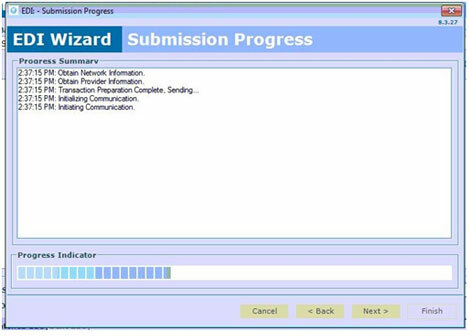 Once it downloads all the responses, you will see a screen like this with responses from insurance agencies below. You will be able to see information such as number of responses and if it was rejected or accepted. We would suggest to check every day for outstanding Email/EDI response from itrans to keep your office up to date. Contact ClearDent Technical Support today!